Background: PDE5A is a phosphodiesterase which specifically hydrolyzes the cGMP to GMP. It takes part in several physiological and pathological pathways and is considered an important drug target. Currently, PDE5 inhibitors (ex; Sildenafil, Tadalafil) available in the market are not only being used for the treatment of erectile dysfunction but at the same time, they are also in clinical trials being investigated as anticancer agents. 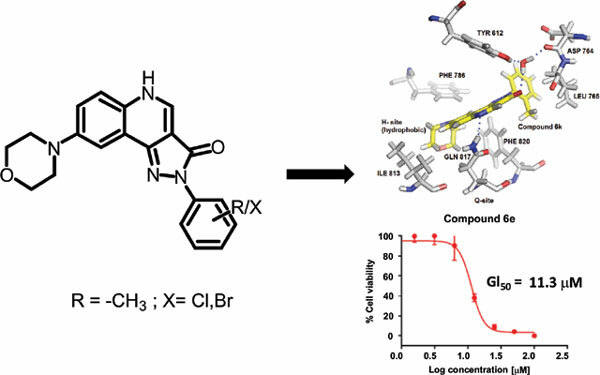 Materials & Methods: In this work, we have examined pyrazolo [4,3-c]quinolin-3-ones as PDE5A inhibitors. Pyrazolo [4,3-c]quinolin-3-ones are the class of tricyclic heterocyclic derivatives having a variety of therapeutically interesting drug candidates known for their anti-inflammatory, anti-viral, anti-anxiety and anti-cancer activity. Therefore, synthetic methods providing access to pyrazolo [4, 3-c] quinolin-3-ones are immensely valuable. Here, we are reporting a simple but efficient route for the synthesis of novel 8–morpholino-2-aryl – 2, 5-dihydro-3H-pyrazolo [4, 3-c] quinolin-3-one derivatives. Results: Further, molecular docking studies of synthesized compounds with human PDE5A protein showed that all the compounds exhibited good docking score in comparison with known inhibitors. In addition, all the synthesized molecules were evaluated against HCT116 cell lines for their antitumor activity. Conclusion: Among all the synthesized compounds, compound 5a, 5d, and 6e showed better cytotoxicity. Thus, these derivatives can be studied as potential inhibitors of PDE5A. Keywords: Phosphodiesterase, Pyrazoles, Cytotoxicity, Docking, PDE5A Inhibitors, GMP. Keywords:Phosphodiesterase, Pyrazoles, Cytotoxicity, Docking, PDE5A Inhibitors, GMP.